Background: TNBS-induced colitis is an experimental immunopathology in rats that shares many features with human inflammatory bowel diseases. Copaiba oleoresin is extracted from plants of the genus Copaifera and is shown to reduce inflammation. Objective: The aim of this study was to investigate the action of copaiba oil (C. reticulata Ducke) on inflammation and oxidative status in the distal colon of colitic rats. Methods: Acute and subchronic colitis were induced in Wistar rats by an intracolonic enema with 2,4,6-trinitrobenzenesulfonic acid (TNBS). The colonic morphology was assessed by histological analysis and the oxidative stress parameters were measured in the intestinal homogenate. The liver damage markers were measured in the plasma. Control and colitic rats were orally treated either with one single dose (acute colitis) of copaiba oil (1.15 g Kg-1) or once a day during seven days (subchronic colitis). Results: The intestinal morphology was severely modified by acute and subchronic colitis, as indicated by the intramural infiltration of polymorphonuclear cells and the increased thickness of all colon layers. The levels of TBARS, protein carbonyl groups and reactive oxygen species (ROS) were increased in the intestine of colitic rats. Copaiba oil did not attenuate the inflammatory damage in acute and subchronic colitis, but it decreased the activity of myeloperoxidase, leukocyte infiltration and oxidative stress in the colon. The level of plasma bilirubin and the activity of alkaline phosphatase were both increased in treated healthy and colitic rats. 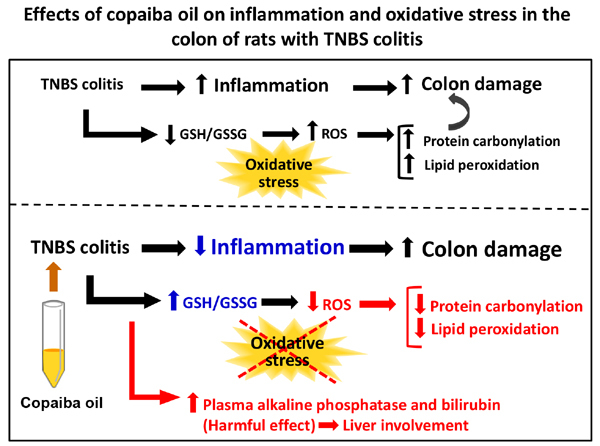 Conclusion: Copaiba oil decreased oxidative stress and inflammation but did not prevent intestinal damage in the colon of colitic rats. The alterations of plasma markers of hepatic damage caused by the oil seem to be associated to its harmful action on the liver. Keywords: Experimental colitis, inflammatory bowel disease, TNBS-induced colitis, copaiba oil, Copaifera reticulata, intestine oxidative status. Keywords:Experimental colitis, inflammatory bowel disease, TNBS-induced colitis, copaiba oil, Copaifera reticulata, intestine oxidative status. Abstract:Background: TNBS-induced colitis is an experimental immunopathology in rats that shares many features with human inflammatory bowel diseases. Copaiba oleoresin is extracted from plants of the genus Copaifera and is shown to reduce inflammation.